An automatic coin-operated cabinet for the delivery of toilet articles to guests of hotels is shown in the illustration. 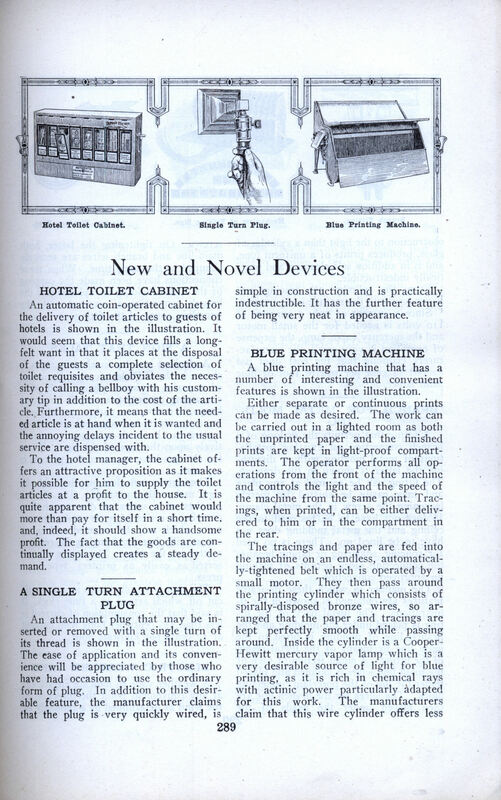 It would seem that this device fills a long-felt want in that it places at the disposal of the guests a complete selection of toilet requisites and obviates the necessity of calling a bellboy with his customary tip in addition to the cost of the article. Furthermore, it means that the needed article is at hand when it is wanted and the annoying delays incident to the usual service are dispensed with. To the hotel manager, the cabinet offers an attractive proposition as it makes it possible for him to supply the toilet articles at a profit to the house. It is quite apparent that the cabinet would more than pay for itself in a short time, and, indeed, it should show a handsome profit. The fact that the goods are continually displayed creates a steady demand. An attachment plug that may be inserted or removed with a single turn of its thread is shown in the illustration. The ease of application and its convenience will be appreciated by those who have had occasion to use the ordinary form of plug. In addition to this desirable feature, the manufacturer claims that the plug is very quickly wired, is simple in construction and is practically indestructible. It has the further feature of being very neat in appearance. A blue printing machine that has a number of interesting and convenient features is shown in the illustration. Either separate or continuous prints can be made as desired. The work can be carried out in a lighted room as both the imprinted paper and the finished prints are kept in light-proof compartments. The operator performs all operations from the front of the machine and controls the light and the speed of the machine from the same point. Tracings, when printed, can be either delivered to him or in the compartment in the rear. The tracings and paper are fed into the machine on an endless, automatically-tightened belt which is operated by a small motor. They then pass around the printing cylinder which consists of spirally-disposed bronze wires, so arranged that the paper and tracings are kept perfectly smooth while passing around. Inside the cylinder is a Cooper-Hewitt mercury vapor lamp which is a very desirable source of light for blue printing, as it is rich in chemical rays with actinic power particularly adapted for this work. The manufacturers claim that this wire cylinder offers less obstruction to the light than a cylinder of glass, produces prints of a uniform tone, and is in addition self-cleaning and practically indestructible. From the cylinder, the tracings and paper pass into the storage compartment. Since a current of only 5 amperes at no volts is needed for the small motor and the mercury vapor lamp, the expense of operation is very small, the manufacturers claiming that the cost does not exceed 1/4. cent per square foot of blue print paper. A fitting that permits the making of a branch connection on existing installations of metal molding without disturbing the latter is shown in the drawing. The fitting can be secured at any place and may easily be shifted by merely loosening the screw in the metal clamp. It does not have to be fastened to the ceiling and the metal molding does not have to be lined up. There is no need for splicing, soldering or taping because the connecting block permits of making an approved connection. The manner in which these desirable features are obtained is shown in the illustrations. The metal back of the fitting is placed under the molding and the branch line of molding is fitted to the main line by means of the metal clamp of the fitting. A small section of each of the main-line wires is skinned and placed under the lug of the porcelain connecting block. The wires for the branch line are then placed under the heads of the screws. On tightening the latter, both main-line and branch wires are securely clamped at the same time. When these connections have been made the capping of the metal molding is replaced and the branch connection is covered with the porcelain cover of the fitting. A decided novelty in electric signs is shown in the E-B electric sign. By means of a series of letter plates, each plate containing twenty-five small tungsten lamps, in connection with a special flasher, some thirty-two changes of reading matter can be made to appear consecutively upon the face of the sign. When the changes have appeared the process is repeated. The ingenious flasher supplied with the sign makes this possible. The flasher consists of a series of discs, each disc carrying a series of letter sticks or contacts which may be inserted and taken out at will, thereby changing the reading matter on the sign. The sticks are inserted as easily as printers’ type in a press. The sign is supplied with an automatic cut off which serves as a time clock. It is said that the consumption of current is less than 1-1/2 cents per hour with current at 12 cents per kilowatt hour. A weather vane to indicate electrically at any convenient point the direction of the wind as determined by a remotely located vane is shown in the accompanying illustration. The movable element of the operating device consists of the vane proper, shaft, inverted hood and brush holder. The stationary part comprises two concentric vertical tubes and a commutator. The indicating device consists of a compass dial with an electrically illuminated lens at each of the eight major points of the dial. One terminal of each of the lamps illuminating the lenses is connected to a common conductor leading to a source of energy and thence to the inner tube of the operating device and the brush-holder. The other terminals of the lamps are connected respectively to the eight segments of the commutator. As the vane shifts with the wind, the brush moves accordingly, making contact with the commutator segment connected to the proper point on the compass. This novel combination of socket, reflector, clamp and handle provides a portable lamp of the greatest usefulness. The socket is so attached to the clamp that it may be rotated through quite an arc and the light projected in various directions. An insulating member between socket and clamp obviates the possibility of shock to the person holding the clamp in the event of the shell or the socket becoming grounded. A reflector of nickel-plated steel shields the light from the eyes and a wire guard protects the lamp bulb from breakage. The clamp is of such design that it may be applied to the edge of a table, the back of a chair, to a shelf, etc., or it may be hung from a hook on the wall. A reinforced cord conducts the current from an attachment plug of improved design. The annoyance of guessing at house numbers on a dark night and in a dark street is one known to many people. The new condulet fixture shown in the illustration renders this annoyance unnecessary as it not only illuminates the house number very clearly, but it supplies sufficient illumination on the steps and porch to enable the caller to walk up without danger of falling over unseen steps or obstructions. A combination flashlight and fountain pen for writing in dark places is the newest wrinkle. A flashlight lamp with a small metal reflector is attached to a clip which slips over the end of the pen as shown, in the illustration. The lamp is connected by a flexible cord to a pocket-sized primary or storage battery which has a push button switch on the case for controlling the light. The light is cast in a three-inch circle about the pen point. Such a device should be useful to stenographers who have occasion to take notes during stereopticon lectures or in poorly lighted places or to mine inspectors and meter readers. As yet this pen is only a novelty and has not been placed on the market commercially. 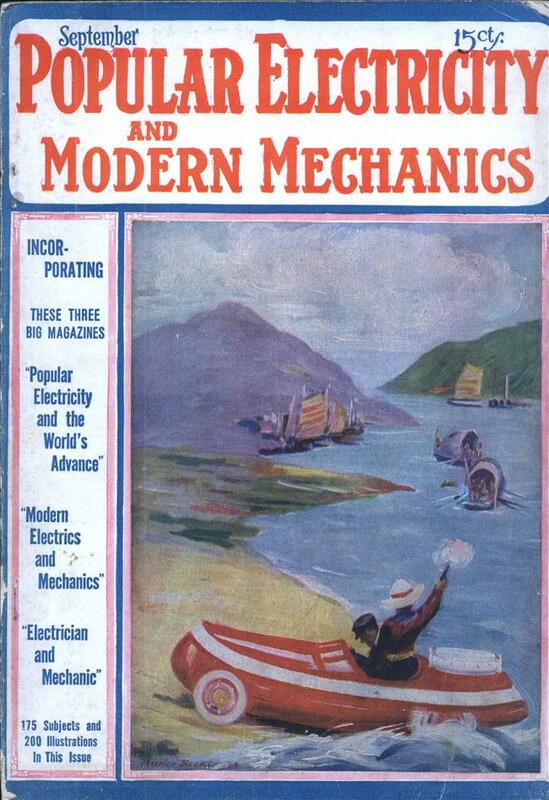 The electric tolling bell shown in the illustration has recently been placed upon the market by an English manufacturer. The device is of particular use in factories either as a fire alarm or as a time signal. In the latter case, it can be operated by a time switch at any desired intervals during the day and without the services of an attendant. An interesting combination padlock is shown in the illustration. The lock is made of brass and is therefore unaffected by temperature or weather. The construction is of the simplest and it is claimed that there are but five parts in the entire lock; furthermore, it is said that there is not a spring, rivet or pin in the mechanism. As to the wide range of possible combinations, it is claimed that more than 51,000 may be obtained with the lock. A fuse plug that indicates when it has blown is illustrated in the drawing. The novelty of the indicator is found in the fact that one does not have to see the plug to determine its condition. A small pin is held within the case of the plug in such manner that when the fuse wire of the plug is melted, the pin is released and is caused to project through the cover. The blown condition is therefore made evident either through sight or touch. An American manufacturer has recently placed on the market a new form of extension rule that possesses several distinct and desirable features. Normally, the rule is closed with all the sections one above the other, so that the rule may be carried about in one’s pocket. It measures but eight inches when closed. In order to open the rule, it is only necessary to pull out the first length, which in turn pulls the second, and so on until as much of the rule as may be desired is opened. The rule is equipped with clever locking devices, which insure the opening of each section in proper rotation and also safeguard the user against errors that might be caused if some sections were not fully extended. In closing the rule, it is only necessary to press a key spring in order to release the second section, which in turn releases the third, and so on. This rule is very useful for taking inside measurements since it can be drawn out to any desired length. OWWW!! I just found that blown fuse. 1914? No wonder they had not heard of bayonet connectors. Though folding rules have largely fallen out of fashion (they’re available but only by special order) there are several things here that I sell in my hardware store that are largely unchanged in 98 years. I have a folding rule my grandfather left me. It’d damn useful as it gives exact lengths and you don’t have to fudge for slack in the tape. Why fuse & circuit breaker panels to this day don’t have lights is a mystery to me. They put them in refrigerators, they put them under car hoods, hell they have portable lights now. But not a damned light anywhere in a panel. You’d think it’d be obvious that the one place you’d need light is a circuit breaker panel.